In the first week of December, inspectors of the Israel Antiquities Authority (IAA) Robbery Prevention Unit arrested thieves carrying out illegal excavations in a cave using a metal detector and other tools. The culprits had been observed by the Arad Rescue Unit working at the so-called Cave of Skulls on the northern cliff of Nahal Tze’elim, about 15 km. west of the Dead Sea and 5 km. north of Arad. The cave is extremely difficult to reach, and the trespassers, young men from near Hebron, rappelled down from the top of the cliff to reach the cave. They were spotted by the Arad Rescue Unit who alerted the IAA inspectors, who came and waited for the culprits at the top of the cliff and arrested them. They were taken to the Arad police station where they were questioned and detained. According to Amir Ganor, director of the Robbery Prevention Unit, scroll robbers have been operating in the area for many years in the hope of finding scrolls, scraps of ancient texts and artifacts left in the caves from the times of the Great Revolt and the Bar-Kochba Revolt, which can be sold for large sums in the antiquity markets in Israel and abroad. He added that it was the first time in decades that the thieves had been caught in the act of looting. The crime is punishable by up to five years in prison. The Turkish government is planning to open a museum to the work of Leonard Woolley and T.E.Lawrence at Jerabulus, where the excavators lived from 1910 -1914, overlooking the site of Carchemish. The museum, due to open next May, is being organized by Nicolo Marchetti of Bologna University, who says they are working very close to an area of fighting between Turkey and Syrian rebels, and they will erect a very high anti-sniper wall around the museum for the safety of visitors. Archaeological work at Carchemish, on the Euphrates, resumed in 2011 and is ongoing. It is often desired to photograph an archaeological site from the air, which helps to see the overall layout and also identify nearby areas that may require excavation. The difficulty has been the cost of hiring aircraft or balloons for the job and the time involved in getting the results. Now in Israel that task has been greatly simplified by two companies that can provide clear and accurate photographs taken from a camera mounted on an aerial drone. The work is done by a pilot on the ground and an expert photographer, who work together and can arrange for pictures taken from all angles. The images are directed straight to the excavator’s computer and the cost is considerably less and much faster than comparable aerial photography of the past. An Iron Age farmhouse of the 8th century BCE has been unearthed at Rosh Ha’ayin, a few kms. east of Petah Tikva. It extends over a large area measuring 30m by 40m and was in fact a small settlement in itself, providing for processing the agricultural produce as well as residential quarters. There was also a number of wine presses found nearby, which suggest that wine production was the most important agricultural activity of the area. According to Amit Shadman, the dig director of the IAA, the farmhouse was built during the Assyrian Conquest, continued into the Persian period of the 6th century BCE and later into the Hellenistic period as well. 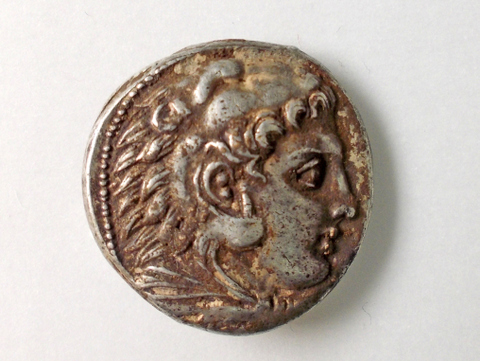 This was confirmed by the finding on one floor of a rare silver coin bearing the head of Zeus on one side and that of Heracles on the other, together with the name of Alexander (the Great). The site will be preserved and conserved within the town by the IAA for the benefit of local residents and visitors.